While I am traveling in Southeast Asia, I try to spend as little time as possible in cities, but as much in nature, especially at beaches or in the ocean. Nevertheless, I was excited to explore Singapore. I did not have a picture in my head what to expect. I just knew it would be a very different country compared to the rest of Southeast Asia. Singapore would be extremely modern and well organized. That was my only idea of it. A short side story: My curiosity for Singapore was based on a flight I once took with Singapore Airlines to New York City about eight years ago. After hundreds of flights, I still remember this one. Why? Because it was the best flight, I ever had. The service of the airline is incomparable to others. Even economy class was provided with a luxurious service. They set very high standards, which is exactly why all the other airlines cannot compete with this particular one at all. Why did I decide to go there and stay that long in the first place? Because I am traveling with time. I do not have any rush. I do not want to have any rush anymore. I want to explore the city or country without being stressed out or having to choose between the sights I will be able to see in a limited amount of time. My idea of traveling is to spend more time at one place to truly get to know it or at least get an idea of people’s way of living there. Only checking out the sights is pointless. It is more fun to get in touch with locals and hang out with them. They will show you the most authentic places and tell you all you need to know about their country and culture. That is at least my point of view. However. 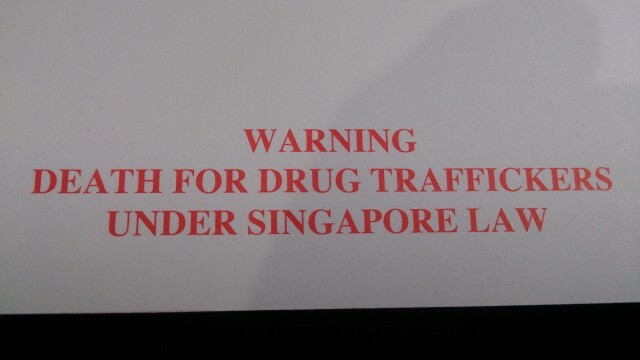 While I was sitting on the airplane, the first impression of what to expect in Singapore was the following warning the flight attendant gave each passenger on board: “Death for Drug Traffickers under Singapore Law”. No comment. Well, a short one: Harsh, harsh punishment. Apart from arriving a little intimidated, my second impression was the opposite. I was walking through the most modern and comfortable airport I have ever been to. They even have chairs for foot massage. For free! What else could you possibly ask for? On my first day, I already explored the Singaporean ‘hawker’, a place where locals can eat a variety of cheap and very delicious food. Depending in which district you are, you can choose between Chinese, Malay, Indian or Singaporean dishes. 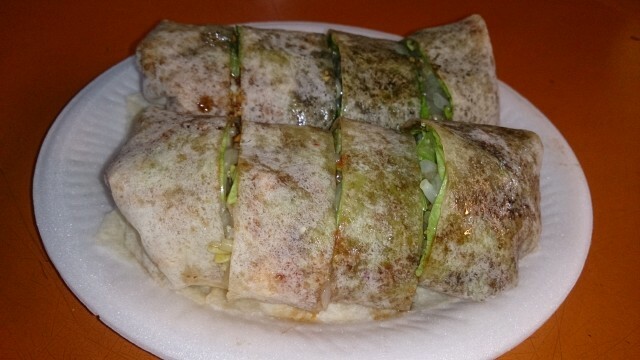 My first ones: Popiah, a Chinese roll filled with lettuce, carrots, bamboo shoot, boiled egg, peanuts and a delicious peanut sauce. If you like it you can eat it spicy, which I personally prefer. Super delicious! I ate it every single day! I am not kidding! It was my favorite dish! Also delicious, but already well known within Europe: Vegetarian spring rolls. Lucky me! Firstly, my hostel (The 5footway.inn Project 2) was located in the heart of Chinatown, which explains the variety of Chinese food close by. Secondly, everyone in Singapore speaks perfect English. It was a dream for me as a vegetarian. I could easily explain what I would like to eat; people would actually understand the concept of ‘vegetarian food’ and prepare it for me. For one week, I was in food heaven! Anyhow. Something nice happened in between. While we were walking around the district, we were bumping into a spontaneous temple ceremony on the street with dancing dragons and lions. That was need! I have to be honest with you. During my week in Singapore I was mainly eating, eating and even more eating. I found a couple of cheap and good places and tried all different kind of dishes. The food was amazing! How about a fresh juice shake for around 1 €? I had one every single day. For example, pineapple-passionfruit, dragon fruit, agave or simply avocado. Yeah, you read it right. The Singaporeans like to drink a fresh pressed avocado juice. It is super delicious! 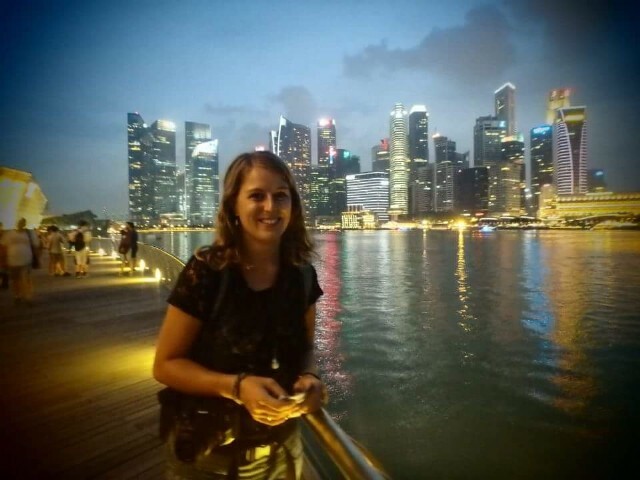 Apart from eating all the time, I also found the time to explore Singapore by day and by night. I emphasize the different times because the city changes its whole atmosphere from day to nighttime. During the day, Singapore represents the commercial, financial and transportation hub in Asia. It is the most convenient place to do business. Singapore is a country of prosperity, growth, development. You can easily tell by just walking there. One finance skyscraper next to each other, in-between hundreds of construction cranes. This place is growing, growing, growing! It is not for nothing that it is number one on the Human Development Index (which includes variables for education, life expectancy, healthcare, quality of life and housing) in Asia, number 9 globally. During my week in Singapore, I quickly felt the high standard of living there. I could even see myself moving and living there for a couple of years. It would not be hard at all. Even though Singapore reminded me of other skyline cities like Shanghai or New York, it was yet different. Singapore is a green, ecofriendly city full of gardens. It makes life so much more wonderful if you spend time in nature even when you are in a city. One of the countries landmarks is the best example for Singapore being one of the leading green cities of the 21st century: The so-called Gardens by the Bay. The huge, colorful supertree structures are not only eye-catching, but also one fascinating solar system of renewable energy. The gardens have so much to offer and to see that you can easily spend a whole afternoon there. Especially the view on the Marina Bay Sands, Singapore’s Flyer and the different botanical gardens are fascinating. If you are doing Singapore on a budget, you should definitely keep the light show every night in the Gardens by the Bay in mind. It is for free and worth seeing it! Spending time in Singapore means you are spending a lot, a lot, a lot of time walking. After my week there, I could have easily used a relieving foot massage if it was not that expensive there… However. You can easily stroll from the Gardens by the Bay to the so-called Esplanade and enjoy the view of Singapore’s skyline. Like I already said go there during the day and during night. The whole atmosphere will change. Aside from all this modernity, Singapore has plenty of religious institutes exemplifying the diversity of its population. Churches, mosques, Buddhist and Hindu temples are all over the city. It reminded me of my trip in China when I was visiting a different temple everyday… At some point, you just cannot be all excited about it anymore… Even though they are beautiful, of course. On the 10th of November there was Deepavali/ Diwali, a Hindu holiday in Little India, taking place. It is the festival of lights that celebrates lightness over darkness, good over evil, knowledge over ignorance in honor of goddess ‘Lakshmi’ who signifies wealth and prosperity. If you are more interested in entertainment, Sentosa is still the right place for you. It is also called the ‘Island of Fun’. You can visit the Universal Studios; ride a rollercoaster or the cable car, and much more. It might be the perfect place for families to get out of the city and have some entertainment. On my last day, I went with a friend to MacRitchie for a hike. Well-prepared without much to drink, eat or even time, we went on a power hike… 10 km in two and a half hours. No running. Therefore a lot of sweating. Why? The hiking trail to the park’s famous bridge was that far away. Usually you would plan at least half a day for the hike. Well, we did it anyway. We did the famous treetop walk, a 250m-long suspension bridge perched 25m up in the forest. Plus, many naughty monkeys waiting there to steal something to eat from you. My friend was in a hurry so we had to find a shortcut out of the park. The rangers showed us the way. We just did not expect to get out on the street leading to a hidden gunpowder factory in the middle of nowhere… Military everywhere. No pictures allowed. No bus. No nothing. Luckily, hitchhiking brought us out of there… Quite an adventure on the last day! My feet were hurting like they have not hurt ever before… Crazy end for a wonderful time in Singapore! As you can see, one week in Singapore is not too long at all! Trust me! There is so much to see and to do. Even on a low budget, you can have a great time there. You just need to inform yourself a little before you are going there. You can find affordable accommodation, cheap and delicious local food, free places to visit and hang out. Plus, after spending time in other Southeast Asian countries, you will appreciate the high quality of living and the modernity of the city. I felt super safe in Singapore. Finally, no one told me any bad horror stories that might happen to me. The opposite. I was walking around in the night; I did not take much care of my belongings, because nothing will happen there. At least, this was my impression.